A road trip with a baby in a vintage VW van: in 3 months from Mexico to Costa Rica. Yeah, the same kind of questions have crossed our minds when thinking of this plan. There are a lot of buts, maybes and uhms to think of and sometimes it makes us nervous too.. However those are just the kind of questions and challenges we love to tackle! In this blog we share with you this idea to travel from Mexico to Costa Rica in a Volkswagen van started, how we got to make a film about it (! 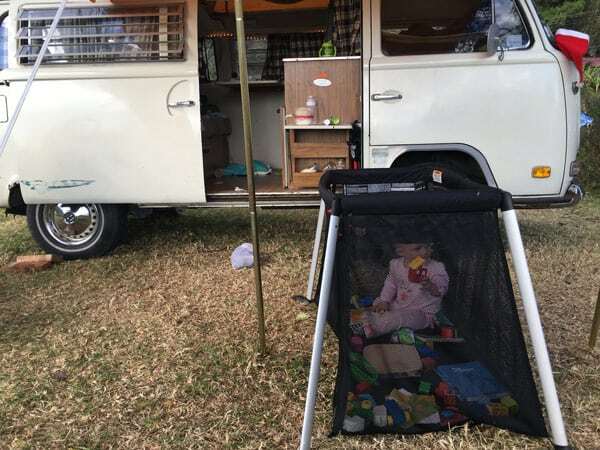 ), how we prepared, what we thought we needed upfront and what we actually really used while camping out of a VW van with a baby. If you are new to this blog, it is good to know that we live a nomadic, traveling lifestyle since december 2011 while working remotely for clients in the Netherlands. We work on the web, build websites, produce videos and help other entrepreneurs set up remote businesses (visit our Dutch company website) and get them started in the digital nomad lifestyle and mindset. Our first destination was Mexico and we hoped to travel to Argentina in the first six months of our one-year digital nomad adventure. In may 2012 we got the chance to buy a vintage, 1972 VW bus in Mexico, that has been our home and travel companion ever since. We never made it to Argentina though, neither did we return ‘home’ after a year experimenting with making money while traveling. We loved the freedom so much, we could not see ourselves return to a ‘normal’ job. So, we continued traveling and have been on the road ever since. Every year in the summer we go back to Europe for 4 months and every year we travel for about 8 months. In november 2015 our daughter was born and in november 2017 we hope to receive a baby boy in our midst. We are currently living in an apartment in Playa del Carmen, Mexico. We return to the Netherlands the end of may 2018 and move back in the van again in october 2018 as a family of four. This blog is about the preparation, execution and lessons learned of our first camping trip (with a baby) out of the Volkswagen van from december 2016 to februari 2017. Steven creates a lifestyle design poster (January 2016, Playa del Carmen, Mexico). Steven and I share a lot of dreams and try to incorporate them into our daily lives as often as we can. Every year, before we start our 8 months leg in travel we sit together, share our ideas and dreams for that travel leg: where do we want to go, do we go in the van, what do we want to work on, what do we want to learn and most important: what do we want to give back when we travel and to whom? We put that on a poster which we have called our lifestyle design poster. One of those ideas on this poster has been to tell the story of living a different kind of life. To make a film about making conscious choices what to do with our time, what to spend it on, how to work, on what to work, where to work from, where to live, how to live etc. We are not film makers and don’t have any experience in this field, so this dream has been on our poster for years. Until we met Marnix and Martijn. Two filmmakers. Crowdfunding campaign on Cinecrowd.com (2016). Long story short: we met Marnix and Martijne while in the Netherlands in the summer of 2016, we invited them over to our house-sitting apartment in the Dutch city of Nijmegen (see pic) and met for the first time as a ‘filming crew‘. They lóved to tell this story and bring a vision into the world. We invited them to travel with us from Mexico to Costa Rica. Combining the story of the actual roadtrip with a baby, who will be for the first time ‘on the road‘ and for her this path will not unbeaten, it will be her ‘normal‘, while also interviewing people we meet along the way who have decided to take a different exit, to live ‘off the beaten track‘ and create their own normal. The two young filmmakers loved the narrative and we jointly started an online crowdfund campaign for this film. Within a 45 days we gathered 21.000 euros to make this film. We bought a second, 1980 VW van in Mexico, the filmmakers traveled to Mexico and started filming in Mexico on december 5th 2016. The idea was to travel together in the two vans to Costa Rica and visit a variety of living communities and introduce ourselves to many different ‘normals‘, while filming the whole process. While planning this camping-filmmaking trip, we were in Europe and had to possibility to take a few things for the trip from Holland. (The filmmaking gear we left that up to the two filmmakers to choose, buy and bring). We deeply realised that this was going to be a BIG adventure, especially because our daughter would be joining us. If you have followed this blog in the past, you know that we love to travel, to invite adventure into our lives. It does not stop when having kids, as far as we are concerned. With kids the adventure has only just begun! 🙂 Nevertheless, we would travel with a little one, we are responsible for her wellbeing and we want to make life as pleasant and interesting as we can for her, for ourselves, and for the two filmmakers who will be joining us. So, if we want to take this adventure safely and pleasantly, how do we prepare for that? What do we have to think of? We love to take you along in these considerations, as it is not very common to take a thirteen month old toddler on a roadtrip from Mexico to Costa Rica in a vintage VW van.. You might also taking a travel adventure with a little one soon, and find these things useful. So, from Mexico to Costa Rica. What’s to see? And why these countries? As we explained in the introduction in this post, we are still on our way down to Argentina. Logically, after Mexico we need to cross Central America to reach Panama to put the van on the boat. And it is a beautiful part of the world right at our doorstep (while us being based in Mexico ;-))! Countries one would not quickly pick for a visit, just because it is not a common tourist destination. Countries like El Salvador, Honduras and, to a lesser extent, Nicaragua, which is growing in popularity the past few years. So, we asked ourselves: what if we make a road trip with the Volkswagen van, down south Mexico, heading towards the Guatemala volcanic black coast into mysterious El Salvador with its flower riviera coastline, amazing surf, small beach towns nobody has ever heard of. Cross into Honduras for what is a 100 km stretch of road into Nicaragua where we will spend several weeks exploring the country before crossing into rainforest covered Costa Rica. We have never been to any of these countries, expect the southern part of Mexico and Guatemala, so we have no idea what to expect. Together with the filmmakers we do some research on the communities that are supposedly living in these countries and that would be interesting to pay a visit. We’ll make a list of that. One of the websites/apps we use to plan our journey is called iOverlander.com: it features any campsite on our planned itinerary as well as local mechanics. Always useful when traveling in a vintage Volkswagen van! 🙂 For the basic mechanics of the bus, we have used a famous book over the past years: How to keep your Volkswagen alive. First published in 1969, this book is for the absolute idiot with cars (us!). We are absolute car-nitwits, but this book helps. It even explains sounds the Volkswagen engine makes :-). Anything we might need to know about border crossings in Central America, we get from this book: Americas Overland. Isa in the outdoor hammock (El Tunco, El Salvador, january 2016). Our daughter will be 13 months the day we leave. We will be camping out of our 44 year old Volkswagen van that we need to prepare for travel with a baby. (You have no idea how that spooked me at first…) We talk about it a lot and made a real plan for it. We decide upfront that we would travel a maximum of 150 kilometers a day, which will take us a decent part of the day. We’ll leave after breakfast and try to make way while she sleeps in the car around 11.00 and we would arrive around 15.00pm. We would make stops whenever necessary. We come up with the idea to travel for one day and then have a few days ‘relax‘ time wherever we arrive to, before embarking on another travel leg. We have two months to cover 1800 kilometers. It must be enough, we think! In hindsight: 150 kilometers was a lot for her, especially in the warmer climate without airconditioning in the van. Most of the days, we traveled about 100 kilometers max. We made one exception to this plan: when we crossed the width of Honduras (1oo kilometers) and did two border crossings in one day (el Salvador into Honduras and Honduras into Nicaragua). We left at 07.00 am and arrived in Nicaragua just before dark. It was the longest travel leg of our journey. While preparing for this trip, we realised we could NOT take a whole lot of stuff from Europe. We have just three bags. One each. There is a lot of stuff you would usually buy for a baby, that you just cannot take. We tried to minimise it to the essentials, focusing on what we really need. I decided to break it down into function: eat, sleep, sit, drive, ride, dress, protect, play. From this list of things we took, there is stuff we use every single day. Stuff we think we are going to love during this camping trip (we are not paid to write this, no affiliate links either). One of the things that I (Diana) really hate, is mosquitos in the van. They just bite me until I have no clear skin left. We started camping in the van without mosquito nets and they always had to have me. So, mosquito nets were my project in the preparation phase! We have several nets: on the back door, the side door, the side windows (comes standard with the outfitting of the van) and the cabin doors. The photo shows the mosquito nets on the side door of the van with our daughter sitting in the dooropening. You also can see the mosquito nets hanging over the cabin doors. These are regular mosquito nets with an elastic band at the bottom of the net you would put over a toddlers bed (ledikant in Dutch), which we put over the doors and have the windows open, enabling the wind to breeze through her bed. ‘What bed? Is there a baby bed in this thing?‘ We see you think… There is this awesome baby bunk bed designed into these kinds of vans back in 1972 when the van was build! It hangs on top of the cabin seats. One of my (Diana’s) biggest worries: what if our daughter won’t sleep anymore? It took us a full 13 months to get her to sleep through the night (I won’t go into details but could write a whole new post on that..) and right before the start of this trip we would change every routine again: no fixed bed, no fixed room, no airconditioning or heating when necessary. ‘How am I going to do this?! ?‘ So, when we bought the van in 2012 we found this bunk bed fold into a hidden cupboard of the bus and we knew other families had used it for babies and toddlers (While preparing the ‘sleep‘ part of the trip, I had found a picture on Pinterest of a baby in a t2 bunkbed, so I knew it could be done). We wanted to make this bed like it would be her ‘room‘, her space to feel secure in, a place she could climb in and out of herself if she would be a little older. The first worry to solve was to prevent her from falling or climbing out when she was still so small. We (still) wanted to have some control of when she would come out of bed. So we had some kind of tent designed in Mexico made out of an old duvet cover of ours in nice pink colors :-). In cold weather this would be her safe space. We could put this ‘tent‘ on top of the bunkbed, put it up and had mosquito nets sewed in. This would prevent her from falling out of the bed on the sides where the windows are open. The picture shows you the tent on top of the bunk bed. In the beginning she would not sleep of course and tried to pull down the tent, climb out, or play with the mosquito net curtain. It took about two weeks to make her familiar with sleeping in this bunk bed, as it is quite different from a normal baby bed. At first she did not want to sleep in it during the day and kept playing. At night, when it was dark, it was no problem, she would play a bit with her bear and fall asleep fairly soon. She did keep waking up once a night for a bottle of water for weeks. If you look at a map of Central America, it is very clear where you are going to cross into warmer, tropical weather: when driving down from the city of Antigua, Guatemala in the highlands of Guatemala towards the coast, the temperature climbs from about 15 degrees Celcius to 35 degrees Celcius during the day. At night it does not get any cooler than 29 degrees Celcius or so. Gone are the long pants to sleep in and also the tent was way too hot to sleep in. And: she grew and became more confident sleeping in this bunk bed. On the second photo you see how she slept once we arrived to warmer coastal climates. No tent, open windows with mosquito nets. She is about 15 months in this picture. Then the next challenge. How to keep her comfortable and safe in the car on the days we would travel? I insisted to have a car seat installed in our van and bought a three point safety belt specifically for the t2 1972 model in Europe to install in the van and then install the seat. The first thing we did when we arrived to the city in Mexico where we would prepare the trip and be able to buy stuff we needed on the road, including a carseat. We bought the car seat at Walmart in San Cristobal de las Casas. While preparing for the trip, we had a mechanic help out to install this seat belt but we could not make it work for some reason. So we came up with a different solution: we bought a thick (enough) strap that we bolted around the chassis below the bench and connected the base of the carseat to it with another strap. It was so sturdy, much more so than with the three point belt, we decided to go for it. It worked perfect! We have added a picture of the carseat installed. If you want to equip your own t2 van with a carseat and are interested to learn how we made it work, please send us an email and we’ll share more photos! Where does our daughter sit and eat? We could not bring a high chair you would usually have with a baby or toddler, we simply don’t have the space for that. So we found a foldable, lightweight sitting solution for babies, called a Totseat. It is made of cloth and you can wrap it around a chair. It keeps the baby upright and safe. We bought it and took it with us. In hindsight: we only used this when we had a fixed chair to connect the Totseat to, like in a restaurant for example. Our daughter did not like to be strapped in either, so what we actually used to put our daughter in to feed her, was our carseat… (see pic) or the baby stroller. The carseat has a washable seat cover and can be placed on a table as well to make feeding her easier for us :-). We have a great, lightweight buggy with a narrow wheelbase. The wheels can be removed and it folds so small that it fits inside a carry on luggage compartment inside an airplane. The small wheelbase is ideal in countries with no pedestrian sidewalks and to navigate stores. In hindsight, the only thing we would like to see changed in the design of this stroller, is some sort of washable seat cover. It gets really, really dirty, especially in the tropics, with rain, mud, dust etc. We do give our daughter food while she is in the stroller, so it is partly due to our own treatment the stroller sometimes looks like it has never been cleaned ;-). Sometimes we can’t sleep in the van, so we also want to bring a camping bed that allows us to spend nights in hotels or hostels. We use a lightweight travel bed, that weighs only 3.2 kgs. Weight is everything when living nomadically as we need to (and want to!) carry all our belongings ourselves. 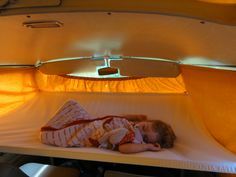 Plus, this way our daughter has a place to sleep that is always the same if we are not in the Volkswagen van, regardless of where we are: hostels, hotels, campsites, on a boat, in tents whatever. It is her bed. We also used the travel bed as a playpant outside the van. This appeared to be a very nice solution to have your hands free for a while and to ‘switch off‘ the constant eye we needed to have on her while traveling and camping. This post was first written in september of 2016 and updated several times. Sept 2016: Until we leave for Costa Rica, we will be in Playa del Carmen, Isla Holbox and San Cristobal de las Casas. Getting the hang of this nomadic life with a baby. A few new things to get used to the coming months in preparation for our roadtrip. We are first time parents who work remotely: we love to spend as much time with her as we can, we don’t have a sitter or use daycare services, so we need to figure out a schedule for work, taking into account the time difference with clients in Holland and of course the climate. We don’t work when she is awake, that’s our most important ‘rule’. Until we leave with the Volkswagen van, we live in apartments we rent or for which we exchange our work. It helps us to make an easier transition to full-time camping. The coming months we learn to live in hot and humid tropics with a young baby: sleep without air conditioning, keep mosquitos out and not go out mid-day for it gets too hot outside. 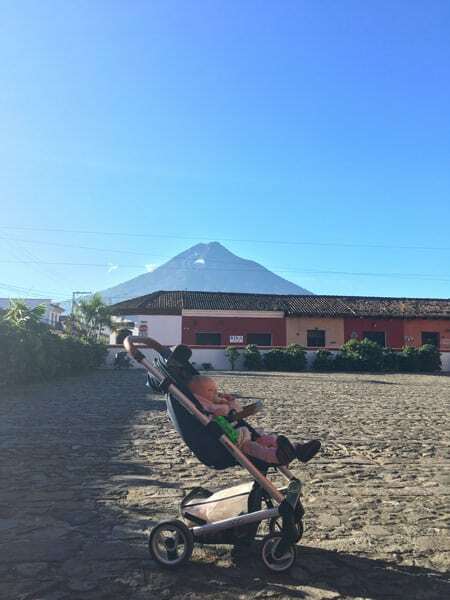 We get used to travel with a baby: within Mexico to some of the destinations we are familiar with and that we love. So, there are many things still to be explored and learned! For us the preparation is half the fun! 🙂 Have you read this post and think: hey, I know something that can help these guys. Don’t hesitate to post it in the comments below. Or maybe you have a question for us: just post it and we will respond 🙂 The coming months we will be updating the blog with posts on our upcoming roadtrip and hope you enjoy the read! Sept 2017: Oh yeah, you were filming as well! Yes! If you’d like to know more about the film we made during this trip, via this link you can watch 8 vlogs (English subtitles) that were made by the filmmakers during the journey. The film premiered (watch teaser) in august 2017 in The Netherlands and an edit is currently being reviewed to show at several European film festivals.